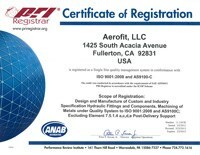 All of Aerofit's products are evaluated and qualified in our own testing facility. 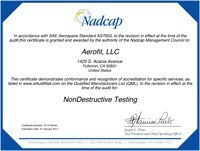 Validation of product performance is proven through extensive testing of sealing integrity, flexure fatigue, impulse and burst strength. Product quality, reliability and consistency are ensured by careful control of raw materials and the use of statistical process control during machining. Aerofit maintains complete documentation and traceability from material heat lot through each step of the manufacturing process.